BIC Pencil Instant Win Sweepstakes – Win a $25 gift card & more! 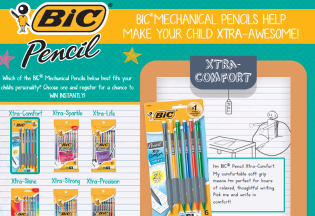 Win a $25 gift card and a pack of BIC mechanical pencils (900 winners)! ENTER SWEEPSTAKES HERE – BIC Facebook page. ENTRY LIMIT – Limit one (1) entry per person/email address per Facebook ID per Daily Period. ELIGIBILITY – The Promotion is open only to legal residents of the 50 United States and the District of Columbia who are 18 years of age or older and who are physically located and reside in the fifty (50) United States or District and Columbia at the time of entry. SWEEPSTAKES PERIOD – The Promotion begins September 5, 2014 and ends on October 4, 2014. PRIZES – There will be 900 winners.